Come eye to eye with wilderness in all its splendor and magnificence, learn about the life and habits of animals, enjoy time away from the city and the everyday hustle, be patient and wily – that’s hunting! For those who like hunting, Azerbaijan offers a lot of excitement: many of foreign visitors have acknowledged this, and more and more hunting enthusiasts visit the country to enjoy wilderness and hunting opportunities. 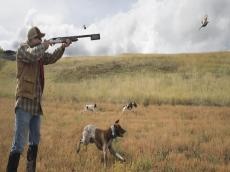 In Azerbaijan, visitors from abroad are allowed to hunt on the territory of the country if they have hunting permission issued by the local authorities. Local tourism companies organize hunting tours and can help foreigner with equipment, transport and permission. Hunts in Azerbaijan only take place within a hunting sector and in accordance with the hunting season schedule approved by the Ecology Ministry. However, hunting is prohibited in certain areas, including National Parks and reserves. The Ecology and Natural Resources Ministry has recently fined and achieved deportation of sixteen Arab tourists for violating the hunting rules. The ministry stated that it analyzed media reports and footages (on social networks) about unethical behavior of foreign tourists during hunting in the territory of Azerbaijan, their disrespect for the country’s values and laws. “Under current regulations, local hunters can hunt up to six wetland birds and one rabbit in one hunting day and foreign hunter can hunt up to ten wetland birds and two rabbits in five hunting days. Foreign hunters usually go hunting in groups and usually tend to share pictures of what they have hunted,” the ministry said pointing to the fact these footages are being analyzed to prevent poaching. The ministry clarified that the facts are being thoroughly investigated before reaching any conclusions. The ministry warned that those companies and travel agencies engaged in hunting tourism should give instructions to foreign hunters in advance to prevent undesirable situations. “If any tourist shows disrespect to Azerbaijan’s values by not observing the ethics of hunting, the cooperation with those tourism companies will be ceased,” the ministry said. Azerbaijan that locates in nine of eleven possible climatic zones enjoys a great diversity of flora and fauna, and is kind of a heaven for hunters. Here, in the different periods of the year, hunters can hunt for Dagestan wild ox, wild pig, hare, wood pigeons, quail, partridge, waterfowl, sandpiper, woodcock, and chamois. The hunting season in the country opens traditionally in late May-June, while hunters need to apply to the Baku Ecology and Natural Resources Department and regional departments to acquire related licenses.